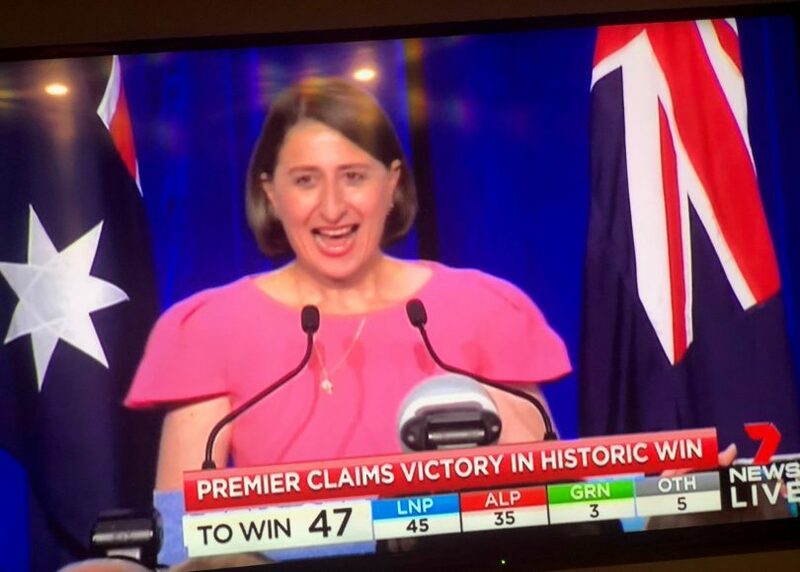 Gladys Berejiklian claiming victory as the first elected female Premier of NSW. Photo: Ian Campbell. There’s no change in Macquarie Street following this weekend’s NSW Election as the Berejiklian Barilaro Government retains power. In Monaro, Goulburn, and Bega, incumbent Coalition members have all kept their seats although some are contending with swings against them. NSW Nationals Leader John Barilaro has increased his margin in Monaro despite expectations that the fight might be close. Labor candidate Bryce Wilson conceded he’d lost the race only two hours into the count while the NSW Deputy Premier, who had lashed out at Federal Nationals chaos, appears to have cemented his own position with local voters. Member for Monaro, John Barilaro claiming victory. Photo: Ian Campbell. Given that Monaro was among the five most marginal Coalition seats, it’s a strong result for Mr Barilaro who seems to have dodged Sydney-centric concerns about stadium spending plans and infrastructure issues. The total swing towards the Nationals looks to be around 8.2 per cent with 52.4 per cent of first preference votes. The former Queanbeyan councillor acknowledged the effort of Nimmitabel-based upper house Nationals member Bronnie Taylor. “Tonight’s success comes from the hard work that we have put on the ground over eight years,” Mr Barilaro said. Reflecting trends across regional and rural NSW, Mick Holton picked up 7 per cent of the first preference vote for the Shooters Fishers and Farmers Party, while Greens candidate Peter Marshall’s 8.2 per cent share of the vote was steady from the 2015 results. Minor candidates Frankie Seymour (Animal Justice Party) and Andrew Thaler (Independent) both collected a little over 2 per cent of the vote. 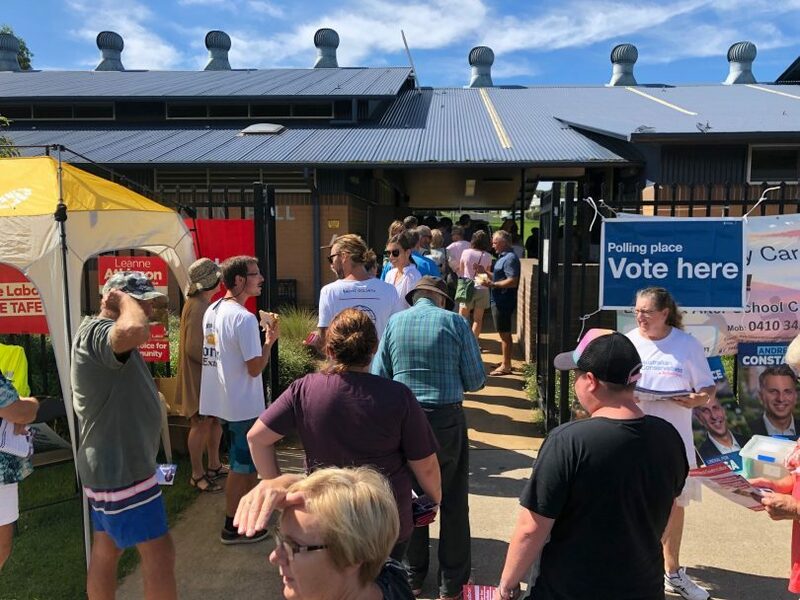 Lunchtime voters at Merimbula Public School faced a wait to cast their vote. Photo: Ian Campbell. In Goulburn, Wendy Tuckerman has pulled off something of a feat after longterm member Pru Goward’s retirement early this year. Former Labor Senator Ursula Stephens had high local recognition in the seat’s eastern population centres, while Tuckerman, a shire councillor from the less populous western end of the electorate was a late preselection albeit with strong credentials. But both major party candidates suffered a swing against them on first preferences: while the seat remains safe for the Liberal Party, their vote declined by a further 8 per cent, while the Labor vote also declined by around 6 per cent. Both Andy Fisher for the Shooters, Fishers and Farmers Party and Richard Orchard for One Nation collected first preference swings of around 9 per cent, while the Greens’ Saan Ecker made only minor improvements on the party’s 2015 result. In total, the swing against the Liberals in Goulburn looks like a shade over 3 per cent. True believers from all the parties at Moruya. Photo: Alex Rea. In the coastal seat of Bega, Liberal Andrew Constance has returned for a fifth term, despite taking a hit of 2 per cent in the face of strong support for minor parties. 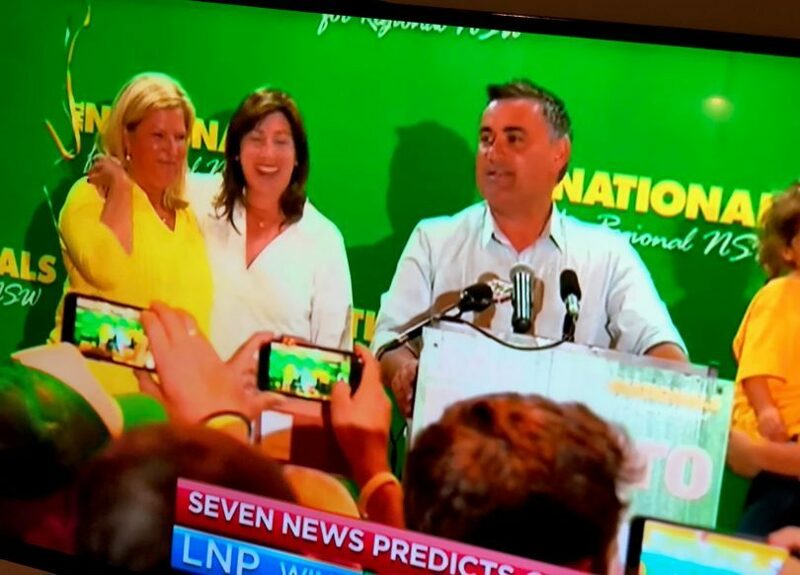 At close of counting last night, Mr Constance had secured 56.4 per cent of the two-party preferred vote, with Labor’s Leanne Atkinson on 43.6 per cent. In terms of first preference votes: Mr Constance 48.7%, Ms Atkinson 30.9%, Will Douglas (Greens) 9.7%, Eric Thomas (Shooters, Fishers & Farmers) 6.4%, Coral Anderson (Animal Justice) 2.7%, Josh Shoebridge (Australian Conservatives) 1.6%. 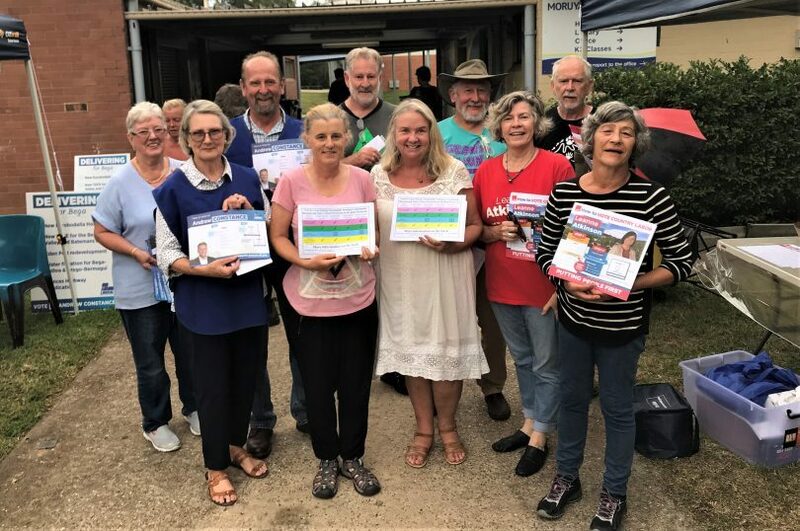 Labor certainly contested this election harder than in recent memory: Leanne Atkinson faced voters for the third time and was among a number of Labor candidates who had been campaigning for prolonged periods. By contrast, ALP leader Michael Daley had only 130 days to make his mark and stumbled badly in the last week. The incentives on offer from both parties across the Capital region were tempting – new hospitals, highway bypasses, art galleries, solar panels and batteries, wharves and rural roads – even beekeepers were offered reduced license fees. However, the scale of government investment in the region over the last four years especially is hard to ignore, even for the most disengaged of voters. 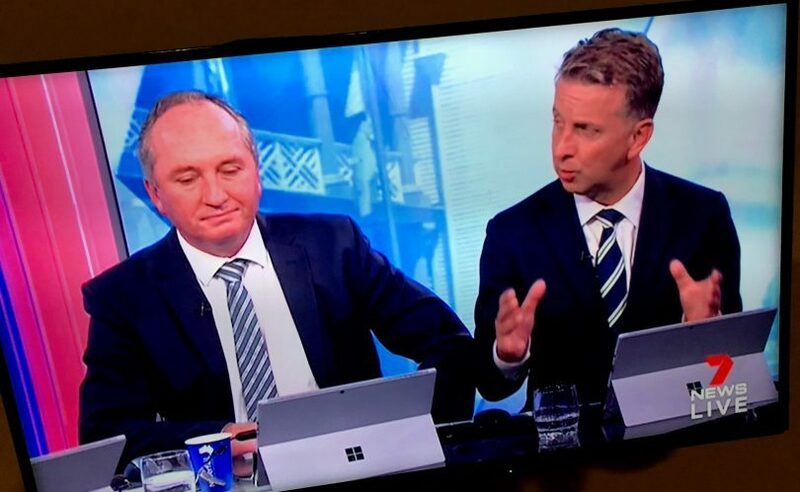 At the end of his stint as part of Channel 7’s election night panel, Mr Constance joked about voter fatigue. The Federal poll is now set to take centre stage with the April budget likely to intensify the national poll which has had to take a back seat in recent weeks. Commentators will spend the days ahead looking for Federal implications from the NSW result. While notching up a solid result in NSW, State-based Liberal – Nationals candidates made no secret of the fact that a lack of faith and respect in their Federal counterparts was at play during their own pitch to voters. How do you read the NSW election results? And what should be the at the top of the Berejiklian Barilaro government’s to do list? I saw the TV coverage yesterday and it showed Gladys dressed and going to the gym the morning after the election. Such a change to the usual political tradition of beer-swilling election night parties and the leaders waking up the next morning with hangovers. a better choice than labor or the extreme left greens. well done Gladiator. Canberrans who are outraged, or at least disappointed, at the survival (just) of a Government which is “soft” on immigrants with PhDs, might take some heart from the thought that (in places other than Canberra), a proportion of the electorate chooses to vote one way in federal elections and the alternate way in a contemporaneous state election. Nah I don't think it will all be same same for the nats leader. Pity. Because it’s regional people who have lost the most. Oh, so they’re not interested in clean drinking water and are more committed to ruining ours? NSW is clearly getting the government it deserves. Bek Clark they sure are! Bek Clark awesome more toll roads in Sydney can’t wait. Yep that's why it's called democracy. Jennie McCulloch is that actually important? The state actually elected it's first female premier! This is bad news for NSW National Parks. NPWS have lost staff and funding over the years of Liberal/Nats NSW Government with detrimental results for the parks. The ‘heritage’ listing of horses in Kosciuszko NP was one of the most ridiculous decisions made. Stand by for a back-flip on that crazy brumby protection decision. The next election is four years away.